The longest format of the game is the, most prominent and the most prestigious format there is. Since this format doesn’t have multi-lateral tournaments, and only bi-lateral ones, the biggest achievement in this format is to be on Top of the ICC Test Ranking Points Table. 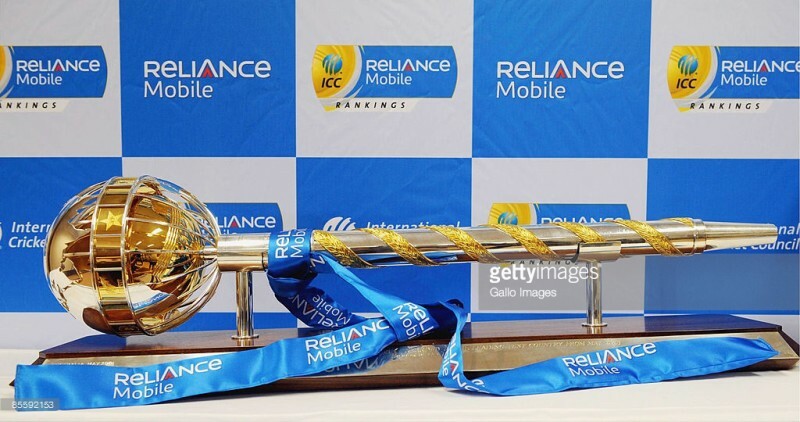 The International Cricket Council awards a trophy, the ICC Test Championship mace, to the team holding the highest rating. The mace is transferred whenever a new team moves to the top of the rating list. Fans of the top team take pride in their team being top and enjoy their reign as the best Test Side in the World. However the issue with the Ranking System is that no one really understands how it works. In this article I aim to break down the ICC Test Ranking System so that every fan can not only understand it, but even work out for himself how the results of an ongoing series would affect the Table when it is updated to incorporate the series result. A series finished 2-1, how would it have affected the table had it finished 3-0 instead, or 1-1? Or by what margin does your favorite team need to win the next series to move up a place on the ICC Ranking Table? These questions have been hard for the cricket fans to answer so far, but hopefully this article can put that to an end. Rating Points (or Points) and Rating are not to be confused with one another. Points or Rating Points, are the sum total of Points earned by winning Test Matches or Series. Rating is arrived at by dividing the total Points a team has, by the total number of Matches it has played. For the purpose of the ICC Table, the team with higher Rating is ranked higher. Decimals are converted into the nearest Whole Number (110.5 = 110, and 110.51 = 111). If two teams have the same Rating, then the Team with fewer Matches will be rated higher. For example, both NZ and Eng presently both have Rating of 99. Now here even though technically Eng and NZ have the same Rating (99), and even though England’s Rating of 99.5 > NZ’s Rating of 99.38, it doesn’t matter as only Whole Number Ratings are taken into account, and the Whole Number rating for both sides is the same (99). NZ are ranked ahead of England as they have played fewer Matches. Now lets get to the ICC table. The first thing to understand is the concept of ‘Matches’ on the ICC Table. Right now the Table covers matches played upto 4 previous years (seasons) upto May. What does this mean? Simply put, that if you (say) looked at the Table right now, it consists of games played in the present season, and the three previous seasons. That is to say the table right now (Jan 2016) the table takes into account all games played during the period Apr, 2012 to Jan, 2016 (May 2012-Apr 2013, May 2013-Apr 2014, May 2014-Apr 2015, May 2015-Jan 2016). Every year the start of May is seen as a season transition, and an Update takes place. During this update all matches played during the oldest season are removed from being taken into account. Therefore every year in May the Table will change after this Update, despite no new matches having taken place. So in May 2016, the results of matches during the oldest period, in this case May 2012 – Apr 2013, will no longer considered for the purpose of the ICC Test Rankings, and matches that are played in the new season will be considered. So if one looks at the table in September 2016, it will feature matches during the period May 2013 – September 2016 (May 2013-Apr 2014, May 2014-Apr 2015, May 2015-Apr 2016, May 2016-Sep 2016). Naturally if a team had a poor run during the period that is no longer considered for the Table, it will benefit from the Update. While this may seem unfair, but there are enough checks in place, to ensure that an update in May doesn’t overwhelmingly affect things, and more weightage is given to the two most recent seasons. I will explain how this is done later in the article. Now that ‘Matches’ have been explained, lets move on to the concept of ‘Points’. 4) 0.5 points extra to both teams if series is a draw. India Beat SA 3-0 to Win The FREEDOM TROPHY. India earned 4.5 Series Points, SA 0.5. 1 point for every test win, so for three test wins = 3×1 Points + 1 extra point for winning the series = 4 Points. The no. of Series Points WI would get = 0 (No tests won or drawn, and series lost). Now how are the 4 Series Points that Australia won from this test, going to translate onto the ICC Ranking Table? How many Points (or Rating Points) is 4 Series Points? How do you convert Series Points into Rating Points? The way to do that is to follow a very simple step-by-step process. The first thing to do is to look at the ICC Points Table, and look at the difference in the Rating of the two sides playing the series, and whether the difference between the Rating of the two teams, at the start of the series is greater than 40 or less than (or equal to) 40. This seems complicated, but its not. Let us continue with the hypothetical example of the Aus vs WI series, which Australia win 3-0. The first thing we need to see is whether the difference between the two team’s Rating is more than 40 or less than (or equal to) 40. A look at ICC Table will give us this info. Aus Rating – 109, WI Rating – 76, so difference between the two sides’ Rating = 33. Now this difference is Less than 40, so to covert the 4 points Australia won in the Series for use in the ICC Table, we will use Method 1 (as difference between their Rating is less than 40). If the difference was more than 40, and say WI’s rating was not 76, but 66, and we continue to assume that the series finished 3-0 to Australia, then not much would change. Australia would still have 4 series points and WI would have had 0. The only difference is that the 4 series points of Australia would have been converted into Rating Points using Method 2A (Australia being the stronger team, as in has higher rating), and WI’s series points would have been converted into Rating Points using Method 2B. This is all that needs to be understood here. Now since both teams are within 40 points of each other, let us Use Method 1 to convert Australia’s Series Points into Rating Points. Now let’s remember, Australia’s Rating before the series was 109, while WI’s was 76. (A simple look at the ICC Test Table will give us this info). Thus, if the series finishes 3-0 in favor of Australia, Australia will earn 504 Rating Points from this series. Now add the Matches in the series to Update the Matches played, but before you do, keep one thing in mind. In this case even though the series had 3 games, the no. of matches will be increased by 4. This is true for all series. After every series, the no. of Matches increased on the ICC Table is always one more than what was played in the Series you are updating. If the series had 5 matches the team’s matches on the ICC Table will increase by 6. If the series had 2 tests, the no. of matches for both teams when updating the table post completion of the series will be increased by 3. Always keep take into account. Its true for all teams and all series. So the updated Matches for Australia = 36+4 (One more than the actual matches played) = 40. So for Australia updated Matches = 40, Updated Points = 4426, and so the Updated Rating = 4426/40 = 110.65 = 111. Thus when the table is updated by the ICC after the series completes, If Australia win 3-0, Australia will jump two rating points to 111, and move ahead of India into second on the points table, who have a Rating of 110. After Updating = M – 33 (29 + 4) (Increase by 4, one more than the total tests in the series, always keep this in account when updating), Points = 2218 + 236 = 2454. So New Rating = 2454/33 = 74.36 = 74. Thus if WI take a 3-0 beating at the hands of Australia, WI’s rating will drop by 2 to 74. I believe this makes the ICC Table much simpler and clearer for everyone. You can now input data and see for yourself how a series ending by a particular scoreline will affect the ICC table. There is just one last thing I need to explain. That is with regard to the concept of Matches. As I said earlier, the matches from the Present and 3 Previous seasons are taking into account for the table. This is just half the picture. though. Lets get to the other half – Matches played and points earned in the two earliest years are cut by half. Okay what does this mean? We know that the table takes into account games played in the present season, and the three previous seasons. Now this 4 season period is split into two groups. Matches played in the two latest seasons and points earned from them (lets call this Period A), and Matches played in the two oldest seasons and points earned from them (lets call this Period B). For example in the present table (Jan 2016), the two latest seasons are May 2015-Jan 2016 and May 2014-Apr 2015 (Period A), and the two oldest seasons are May 2013-Apr 2014 and May 2012-Apr 2013 (Period B). Now why this division into two different periods? This is because while all Matches and all Points from Period A are considered for the present Rankings, only half of the Matches and the Points earned from Period B are considered for the present Ranking. This concept will become very clear after the following example. Suppose in Period A, a Team played 15 Matches and from them collected 1800 Points, while in Period B, the same Team played 12 Matches and from them collected 1200 points. Now one would think that on the table this would be combined on the table. So from 27 (15+12) Matches the team would have 3000 (1800+1200) Points. Therefore the teams Rating would be 3000/27 = 111.11 = 111. However that is not done. To ensure that recent performance have more weightage in the rankings, only half the Matches and Points from Period B, are considered. Half of Period B = Half of (M – 12, Points – 1200) = M – 6, Points 600. So the Rating for this Team will be 2400/21 = 114.28 = 114. However this is only to give you a complete understanding of the ICC Table and now you have it. In updating the table with results from ongoing or just finished series’, one doesn’t have to worry about Period A, and Period B, and half Period B or any of it. All this is already done on the ICC Table, one merely has to take it forward from there on, and simply update the recent series results on the table, to get new Ratings. The method to do so has been explained earlier, and just use the three formulas (Method 1, or Method 2A or 2B) given, depending on whether the difference between the teams involved is more than 40 Rating or not. Hopefully to those who have read the article the ICC Test Rankings will no longer be a mystery from now on.